Attention all rising college juniors and seniors with interest in biomedical research: apply for our 9-weeek summer internship now: deadline is March 15, 2019! “The Center for Precision Medicine Undergraduate Summer Internship Program not only exposed me to groundbreaking research across several cutting edge disciplines, but also provided the platform and techniques for a successful career in medical research. With my mentor designating so much of his time to my learning, I have gained a comprehensive skill set and knowledge of the medically relevant state of substance abuse research from a neurobiological perspective” (Alex H., intern 2018 ). “The CPM Summer Internship allowed me to experience a new research environment in the Wake Forest community. The faculty at CPM are enthusiastic and passionate about their work. They were extremely helpful in my preparation for graduate school” (Taylor O., intern 2018). Center for Precision Medicine seminars or collaborative discussions take place on Wednesdays at 12:00 noon. Locations alternate by month between the Medical Center Campus (even months; Hanes G-28) and the Biotech Place downtown (odd months; Auditorium). Click buttons below for current schedules. 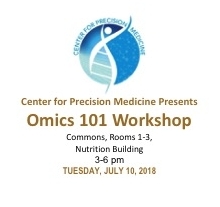 In fall of 2018, the Center for Precision Medicine started a new Omics 201 1-hr lecture series based on the successful “Omics 101 Workshop” with more in-depth information ons tate-of-the-art “omics” methods and technologies. The Center for Precision Medicine’s Undergraduate Summer Internship Program offers a 10-week hands-on research experience for undergraduate students. Students will participate in ongoing research projects in the laboratories of Center investigators. On August 10, 2018, our summer interns completed their 10-week research program in the Center for Precision Medicine with a Poster session. They also presented individual scientific talks on the research topics listed below. More information on our current graduate students will be posted soon. More information on our current postdocs will be posted soon.